There’s only one thing more summery than juicy, ripe peaches: Juicy, ripe peaches frozen into sweet, melty, almond milk popsicles! It’s summer on a stick, friends. First, you need to get your hands on some really good peaches. If you can’t find good peaches, use whatever juicy peak-season fruit you do have. (Sliced strawberries would be excellent here). For the base, whisk Vanilla Almond Breeze, with a touch of coconut oil and maple syrup. You could also use plain (sweetened) almond milk and add a bit of vanilla bean. (I’d stay away from vanilla extract this time). These are pretty lightly sweetened, which is my personal preference. Feel free to add more maple syrup if you wish. Or get fancy and simmer your peaches into a peach purée. Fill a popsicle mold with chopped peaches and pour the almond milk mixture over top. Don’t worry, if you don’t have a popsicle mold, you can use little cups instead. Just let them freeze for an hour or so before placing the sticks. Now the hard part: waiting. Let them freeze overnight (or about 10 hours). Try to take the photo quickly before they melt all over your countertop! If you make these, tag #loveandlemons on Instagram so I can see! Bring vanilla almond milk to room temp, (otherwise the melted coconut oil will harden as you add it). Whisk the almond milk together with coconut oil, maple syrup and a pinch of salt. 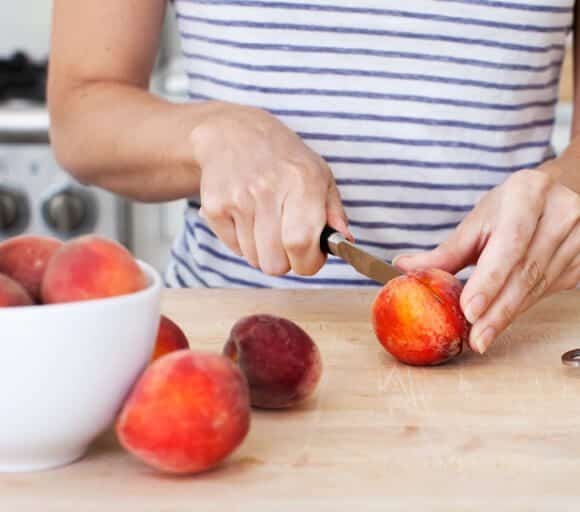 Slice peaches into small pieces and drop them into a popsicle mold. Pour the almond milk mixture over the peaches. (Depending on the size of your peaches you might have extra). Place sticks, then freeze overnight. 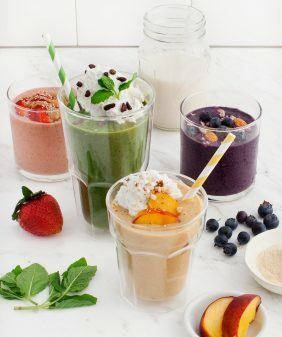 Don't use unsweetened almond milk or you will have to add more sugar to the recipe. If you don't have a popsicle mold, you can freeze them in little cups. I have this popsicle mold. 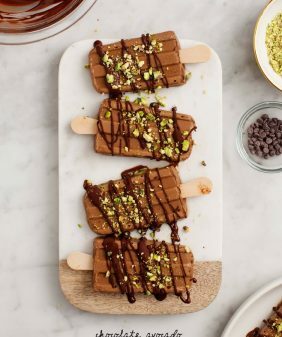 recently discovered the joy of almond milk, and am sort of into everything popsicles right now – so this post is sort of speaking to me! peaches are almost in season here, so will definitely be trying this soon! These scream SUMMER! Love them! These pops look cool and refreshing! I would love to try your peach puree idea too! 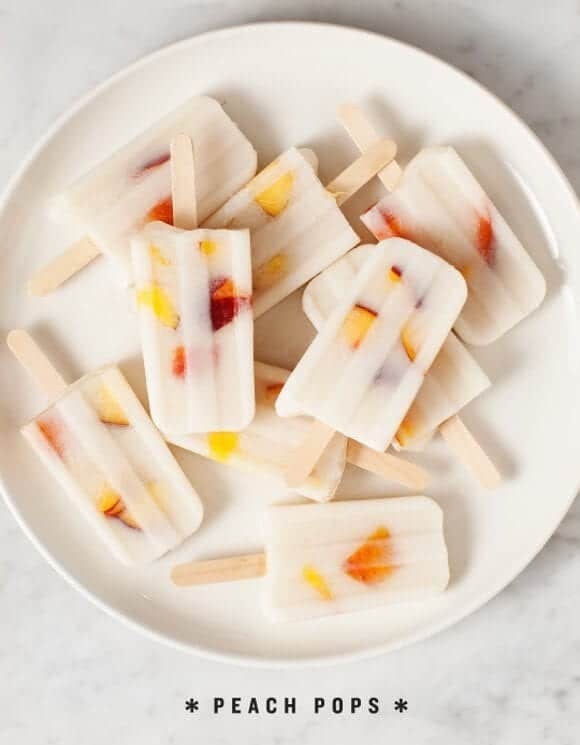 These are gorgeous… I love that they’re vegan and I love the milky white contrasting with the juicy summery peaches. Yum!! You’re making me love summer even more! I need these in my life. Why haven’t I bought a popsicle mold yet?! Peaches definitely scream summer! Love these pops! It’s so pretty. I can imagine that the flavour is amazing as well, but the visual aspect is perfect. mmmmmmmmmmm texas peaches! this looks so super good. need to buy a popsicle mold stat!! awesome!!!! Can you share where to purchase the molds? Thank you!!! Ahhh these look so good!! Definitely making them with my Peach Truck haul on Wednesday! These are gorgeous! And I’m pumped about the fact that they’re healthy too. We finally just got peaches at the farmers market last week so I’ll try these soon. Thanks! I love it when fruit is so great it can count as “dessert’ without much else. Love the look of these… and I’m kind of obsessed with finding the BEST peaches right now. I’ll have to give these a whirl. Also… don’t you love that popsicle mold? I have one too and it’s the best! I’ve been thinking about an almond milk-based dessert recently. So happy you shared this. Peaches and vanilla sound amazing together. Waiting that 20 hours might be too hard! ha, well they don’t need quite 20, I’ve made them in the morning and they’re ready by evening (and vice versa!). haha. That was a typo on my part for sure! Freudian slip maybe? 10 hours might feel like 20 when dessert is involved! These are so pretty!!! Cannot wait until Colorado peaches are in season! Yum! 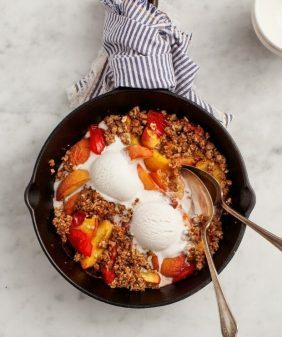 It is still a little early for peaches here, but I have all the ingredients, and some strawberries that I need to use, so I will be making these right away! Thank you so much! I love your blog. Let me know how they are with strawberries, I’m excited to try! Oh, yes! Peaches are in full swing where I am and I have a few juicy ones on my counter right now. 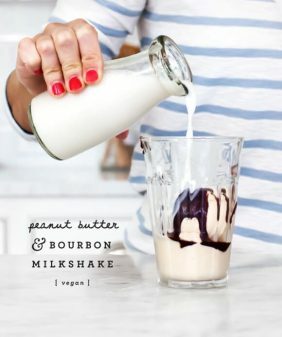 I must make these tonight! Peaches are my life right now! can you believe i NEVER had a fresh peach until this past weekend?! I know… very, very sad. Will make up for lost time starting with this recipe! P.S. Not to self promote, but I just posted a video over on my YouTube channel talking about my favorite healthy snacks that I can buy at a store when I simply don’t have time to make something myself. I sincerely thought you might be interested, so here’s the link if you are! http://youtu.be/NqUOXdwSAYM I think of all my fave health/food bloggers when I make videos like this one… So of course I thought of Love and Lemons! So simple and tastes delicious! I’m going to try this with a range of summer fruits from the garden. I love peaches and cream, so this looks right down my alley! Hi I was wondering if there’s an alternative for coconut oil? These look good, but would omitting it ruin them?? It just adds a tiny bit of richness, you could leave it out if you want. wow, this is inspiring me to order a popsicle mold asap!! 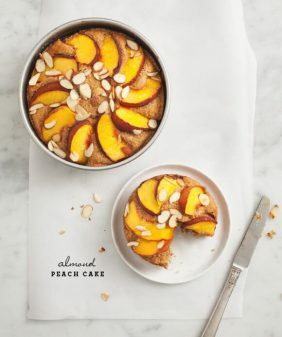 Love anything peach, thanks for sharing this recipe! mmm great popsicles recipe for summer! This looks amazing! 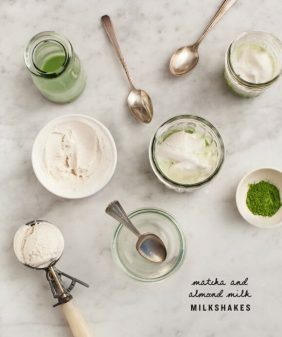 Have you ever considered putting fresh herbs in your frozen treats? I just made Mango Basil Frozen Yogurt (inspired by a trip to Quito, Ecuador) and it turned out to be a delicious and very unique treat. Worth experimenting with! understand. It sort of feels too complicated and very broad for me. to put this informative article together. I once again find myself spending a lot of time both reading and commenting. I use unsweetened almond milk. However I use 1 1/2 tablespoon of orange blossom honey. Perfect. Thanks for the recipe. Vanilla and peaches go so well together! I love making popsicles, so I’ll have to add these to my list. They’re mostly ice with a hint of almondy peach. Any ideas on what I could’ve done wrong? I used unsweetened almond milk and upped the amount of maple syrup, but I can’t imagine that made the difference…. I’m not sure if the unsweetened makes a difference because I only tried it with sweetened vanilla. Mine weren’t super creamy, they’re definitely a lighter snack (I packed mine full with peaches so they were more peach than milk). If you wanted a creamier pop, I’d try adding yogurt or full fat coconut milk – the more fat, the creamier they’ll be. (You could try simmering the peaches which would bring out more flavor too).